Maryland Curbscape is here to fulfill the concrete needs of all homeowners in the Annapolis area. 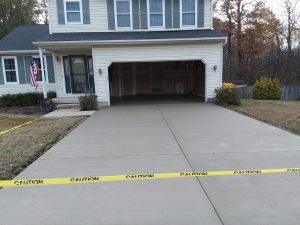 We provide traditional and standard concrete–from driveways to sidewalks, we can create or repair any concrete slabs or structure your home may need. 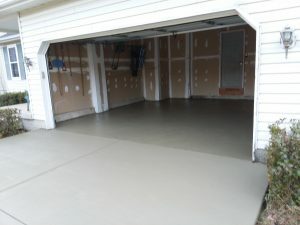 Recently, we completed a job for a local family’s garage door concrete slab. The major issue was that the garage door was sinking, or “buckling” into the uneven joint in the slab, leading to another issue, where the driveway doesn’t properly adjoin to the slab. This issue is common for older garages, but years of weathering may take its toll on the concrete slabs. 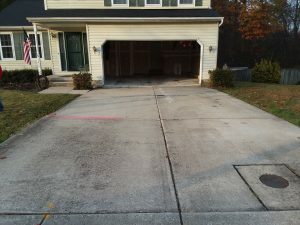 In this case, the Maryland Curbscape solution was to jackhammer and remove the garage door slab and the rest of the entire driveway. After that, we applied new concrete to the driveway, and fixed the slab issues—and it only took one day to complete. 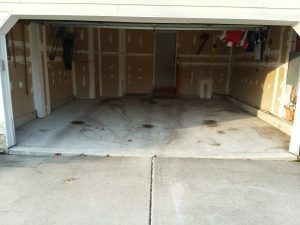 The process can be completed without emptying the garage, floors are able to walk on almost immediately, and best of all–the process fixes the root of the problem, reducing the likelihood of future sinking issues. If any issues involving your concrete slabs happen to occur, we provide products and services that will take care of it. Our experienced team of professionals have an in-depth knowledge of how to determine what needs to be fixed and give homeowners a fair quote. We also offer services to help spruce up the home’s curb appeal—although, that might not be the way to save you money, it bumps up the price of the home, especially when preparing to sell it. Unlike gray or “regular” concrete, stamped concrete is finished with over 40 different colors to choose from. While the concrete is still “wet”, the surface is embossed with textures and patterns that closely resemble stone, brick, slate, tile, or wood. Stamped Concrete is perfect for new construction and upgrades to patios, driveways, walkways, pool decks, or any other outdoor living area. When compared to traditional edging and border products such as wood, stone, brick, plastic, or metal—concrete curbing outperforms them all. Despite the abundance of benefits, it still remains surprisingly affordable. When homeowners choose Maryland Curbscape, the project is completely custom–each job is performed to the exact specifications, from design, to color, to layout. The team at Maryland Curbscape is passionate about providing quality service in each of our projects. We look forward to bringing our best for the people of the Annapolis area. For more information about what we do, or if you’d like to see some of our past projects, click here.